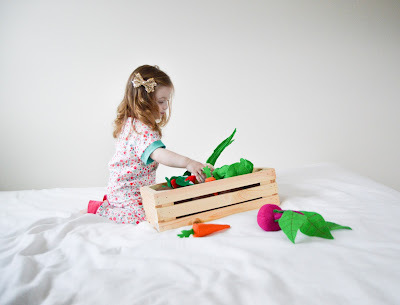 I am seriously so excited about today's feature, to introduce you to one of our new favorite shops and tell you about one of our most loved toys! I came across the shop "Little Beasties" around the Holidays on Etsy and boy am I glad I did, not only was I able to connect with the most lovely lady behind the shop but she also sent us the most adorable toy set, a play felt garden box, which is now one of Bella's most played with and beloved toys since she received it, and if I'm honest, I think I may love it just as much as she does. 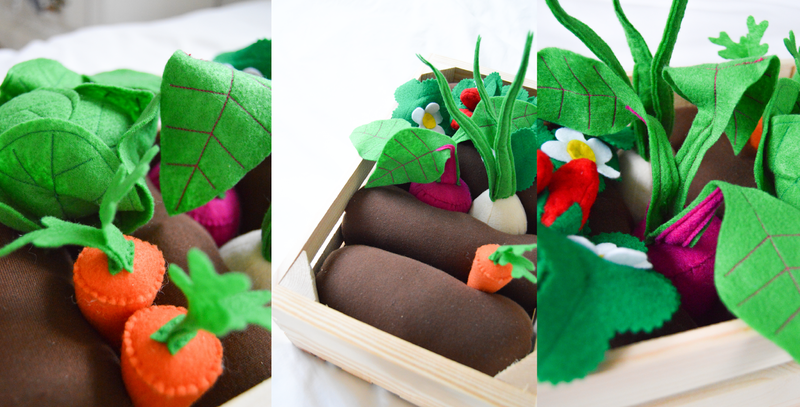 This garden box is filled with jersey "dirt" rolls, felt carrots, a felt onion, felt lettuce (with a pipe cleaner base to keep it tucked into the dirt), a felt strawberry patch (complete with delectable looking strawberries, sweet little flowers, leaves and a pipe cleaner base, the strawberries also feature velcro so the strawberries can be "plucked" right from the plant!)... and my personal favorite... the beet. Now, I'm really not a huge fan of the taste of beets, but I think they're beautiful, so this beet is perfect! Now we can "drop the beet"... *laughter*applause*laughter*. If you live anywhere cold like we do (or even if you live in a warm area) this is the perfect toy. 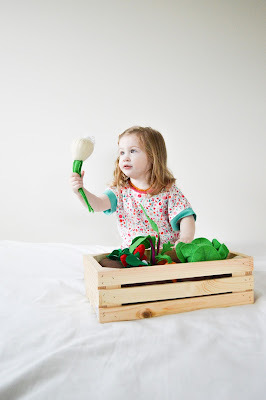 Here in Pennsylvania we're stuck inside for a good portion of the winter due to the bitter cold, and well, toddlers get cranky and bored being indoors for that long, especially when the said toddler loves being outdoors. I bring this garden set out whenever the winter blues/crankies come out and its the perfect remedy! The beautiful colors instantly brighten our moods and out come smiles... and hours of imagination, giggles, play and fun! 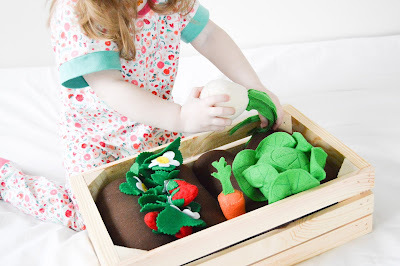 Bella loves being able to "plant" the veggies and "harvest" and "eat" them over an dover again. 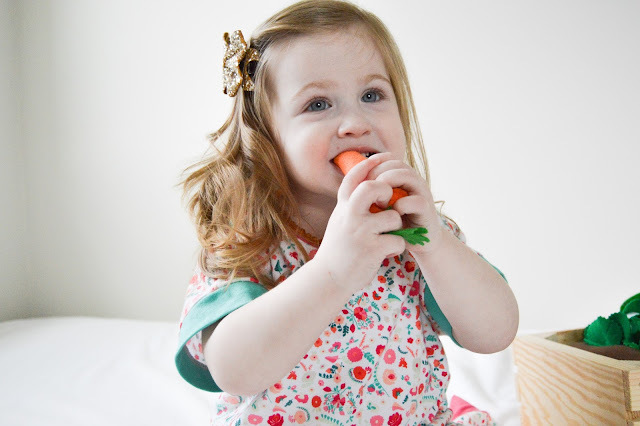 The carrots are her favorite to "eat" and she loves pretending with all of the veggies: play feeding all of us and her stuffed animals and dolls. Its simply a blast! 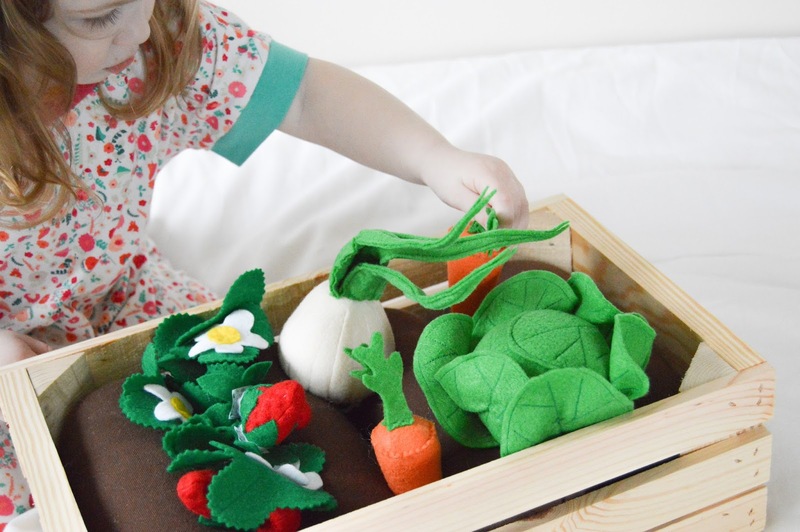 I love seeing all of the love that went into this little garden, most of it hand stitched! 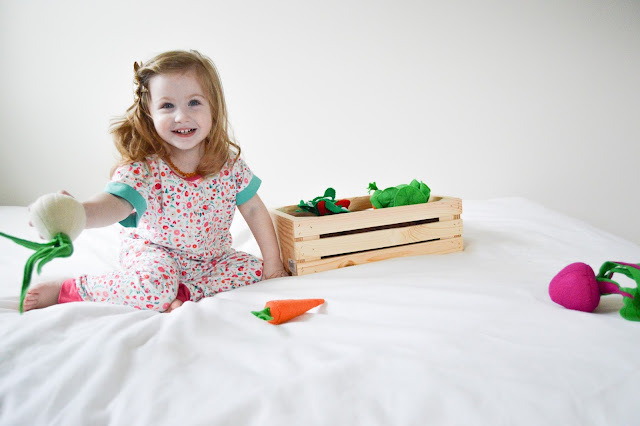 It's perfect for winter play, rainy day play and every day play! Perfect for the young, and the young at heart. It's perfect for... well... It's just perfect! 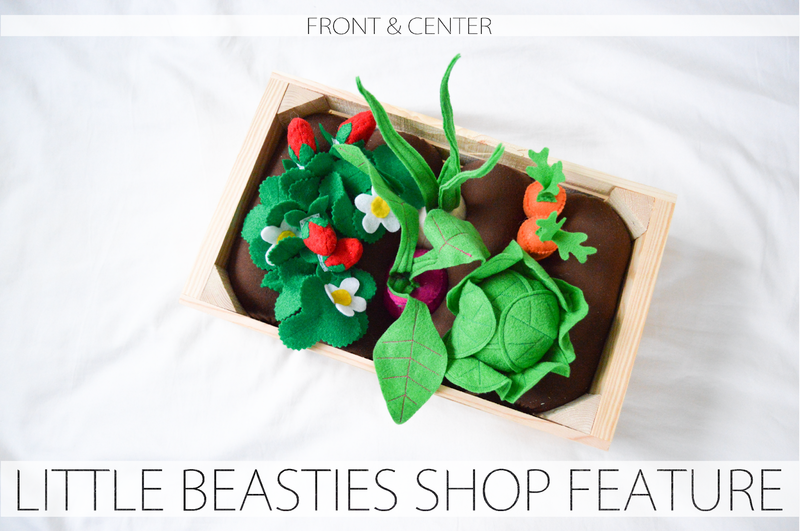 I'm excited that I was also able to conduct a little interview (below) with Jess from Little Beasties shop so you can learn a little about the shop and products from the artist herself! HI JESS, CAN YOU TELL US A LITTLE ABOUT YOUR SHOP, LITTLE BEASTIES? Hi April! I opened Little Beasties 7 months ago as a way to earn a little extra income from home. I make and sell cloth toys, most of which involve a fair amount of hand-stitched details. I work mostly with flannel and fleece, with a little felt and cotton thrown in occasionally. WHAT IS THE INSPIRATION BEHIND YOUR SHOP? Like a lot of other mom bosses, the inspiration behind my shop is my son. When he was born, my husband and I swore to ourselves that we wouldn't have a ton of bulky plastic toys take over our lives (easier said than done, right?). We've grown to love unique, hand-crafted toys over the last three years, and it's nice to feel like the toys in his space are truly unique to him, and we won't be seeing them at every playdate. He play-tests all of my designs before they hit the shop, not only for fun, but also for durability. If a rambunctious 3-year-old can't destroy it, then I know I've done my job well. WHEN DID YOU FIRST BECOME INTERESTED IN AND START MAKING TOYS? 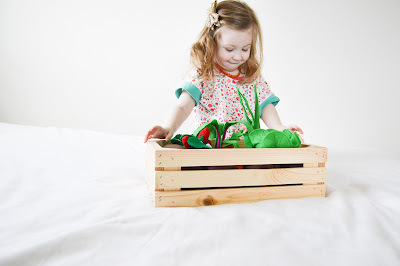 I first started making toys in the fall of 2014. I was determined to hand-make all of our Christmas gifts that year, so I made a quiet book, an alphabet, and an early version of the fishing game that year. When my son turned 2, I made a bunch of beasties as party favors, and was hooked from there. I wasn't really sure if I'd be able to make something of it, but it never hurts to try! I'm 100% self taught. I bought a sewing machine 6 years ago and then was too intimidated to ever use it. It sat in a closet for a long time. It's been a lot of trial and error, and I watch a lot of YouTube videos (and make frequent phone calls to my grandma for advice). But I think it's the best way to learn something. You'll never figure out the way things work best for you until you just jump in and do it. WHAT HAS BEEN YOUR PROUDEST MOMENT AS A SHOP OWNER? I think Christmas of 2015 was my proudest moment so far. It was hectic, and I stayed up late working on things a lot more than I would have liked to, but it was so worth it to get all the reviews and photos from my customers Christmas morning. It's kind of amazing to know that so many children were opening gifts that I made with my own two hands that day. WHICH PRODUCT HAS BEEN YOUR FAVORITE (SO FAR) TO MAKE? How awesome was that! I always love find out the story behind shops and if there's ONE toy you need, you definitely need it to be from Little Beasties Shop, especially that garden! 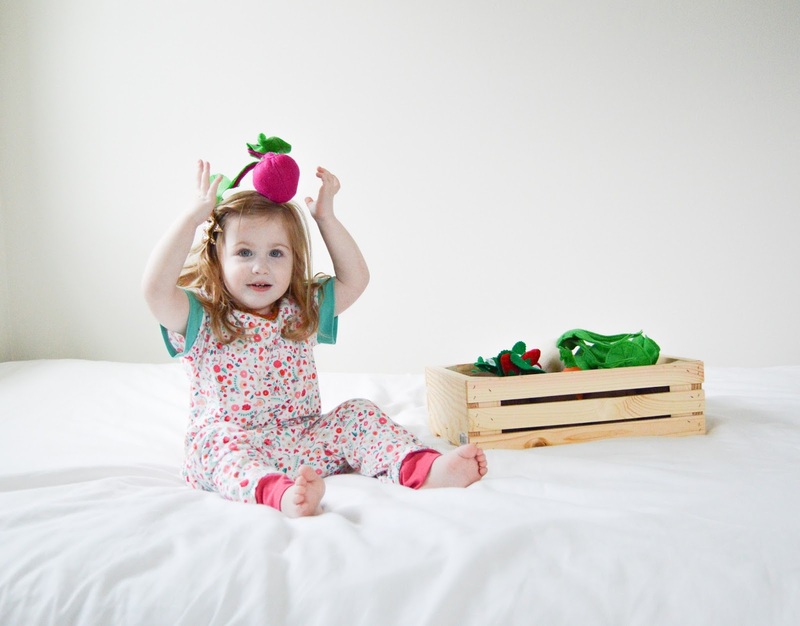 Head on over to Little Beasties Shop to find out more and see all the toys she has to offer for your little ones! I'm so excited to announce that I’ve partnered up with Jess from Little Beasties Shop to giveaway a $20 Shop Credit to one of YOU! Entering is super easy too! Full details on how to enter can be found over on my Instagram page (direct link found here)! Good luck!